Switch over to an aqueous Parts Washer. It’s about time. Those old solvent based parts washers use hazardous petroleum based solvents and detergents that are at least somewhat hazardous, and in many cases, very hazardous. At the very least, it’s not good to have it in contact with your skin on a regular basis, as this has the potential to have long term health effects. Worst case scenario is fire. These hydrocarbon based cleaning agents are very flammable. Most have a flash point of around 135 to 145 degrees. Modern aqueous parts washers are completely safe, as the detergent has no properties or ingredients listed as hazardous. They can also clean just as effectively as solvent based parts washers too, provided you use a good detergent concentrate, and the parts washers has a heating element. Heat must be added to the equation when using a water based detergent in order to clean at it’s peak potential. Help prevent avoidable back injuries. This is one of the most common issues. One way to help is to get a pneumatic wheel lifter. If your employees don’t have to stoop down and lift heavy 145 lb. 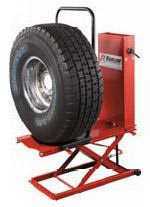 wheel, and then place it on the Tire Changer, they are a lot less likely to file for worker’s compensation. Of course there are many other safety practices and safety equipment that you can purchase. Eye protection, and proper breathing apparatus is always important. Keep employees trained on all the latest technological advances as well. For instance, when air bags first became prominent, many techs didn’t know that they could still deploy even after an accident. This can be a hazard when you’re working on a wrecked car and it suddenly slaps you in the face or chest when your working on the car. Always disconnect the battery to prevent unintentional airbag deployment. Let us know of any other safety practices or equipment we may have missed. This is a good forum to showcase this important and helpful type of information.